Please note that the above slideshow is automatically created by searching Flickr and does not contain manually curated images. 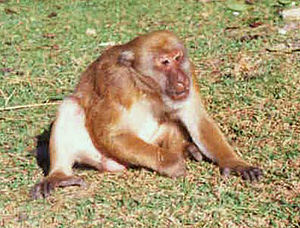 Hence, it is likely that some images may not be of Macaca assamensis. Primates The Primates are an ancient and diverse eutherian group, currently with around 233 living species placed in 13 families. Most dwell in tropical forests. The smallest living primate is the pygmy marmoset, which weighs around 70 g; the largest is the gorilla, weighing up to around 175 kg. According to fossil evidence, the primitive ancestors of primates may have existed in the late Cretaceous period around 65 million years ago, and the oldest known primate is the Late Paleocene Plesiadapis, c. 55–58 million years ago. Molecular clock studies suggest that the primate branch may be even older, originating in the mid-Cretaceous period around 85 mya. Primates have diversified in arboreal habitats (trees and bushes) and retain many characteristics that are adaptations to this environment. Some of the most distinguishable and important adaptations include presence of opposable thumbs and big toes; a trend towards a reduced snout and flattened face, attributed to a reliance on vision at the expense of olfaction (smell); a complex visual system with stereoscopic vision, high visual acuity and color vision; a highly developed brain and a trend towards holding the torso upright leading to bipedalism. This page was last modified on 13 February 2011, at 15:48.